Contact Alig Technology Group, Inc.
E-mail. Call. Send us files. 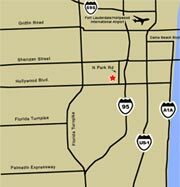 Centrally located in the heart of the South Florida Tri-county area, our office is just minutes away from the Fort Lauderdale International Airport, the Florida Turnpike and Interstate 95. We are just west of I-95 on the eighth floor of the Regions Bank Building on Park Road. If you would like to send us files, we can accept files up to 2MB via email. Any files larger than 2MB should be sent via FTP. This is a very simple drag and drop process. Please contact us for your username and password to send the files.